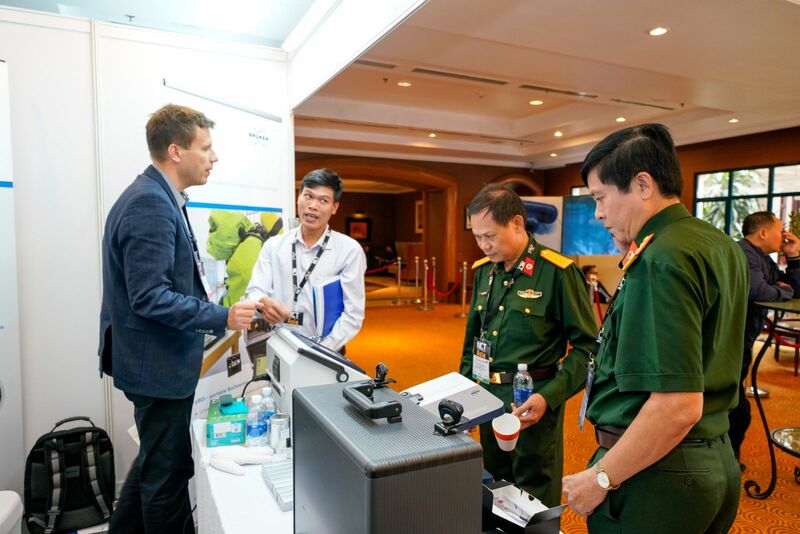 The leading CBRNe, C-IED and EOD event, NCT Asia 2018 was held in Hanoi, Vietnam in official partnership with the Military Medical Department of the People’s Army of Vietnam. Taking place at the Sheraton Hanoi Hotel from the 9th to the11th of October 2018, over the course of three days, the event hosted a conference stream, an exhibition and its famous networking receptions. NCT Asia 2018 acted as the perfect platform, bringing together local, regional and international government representatives, leading industry experts, first responders and decision-makers to share their expertise in the fields ofCBRNe, C-IED and EOD. Together with the support of civil institutions such as the Vietnam Agency for Radiation and Nuclear Safety (VARANS), NCT Asia2018 closed as a very successful edition of NCT, and its11th edition in Asia! The event kick-started with a networking reception in the exhibition area at the Sheraton Hanoi Hotel, acting as a perfect ice-breaker in preparation for the first day of the conference on the 10th of October in the midst of state-of-the-art technologies. NCT Asia 2018 welcomed 250 delegates, with important delegations from the host country Vietnam, as well as regional delegations fromThe Philippines, Hong Kong, Cambodia and Thailand amongst others. A few notable delegations present included local Vietnamese delegations from the Military Medical Department of the Vietnam People’s Army, the Chemical Corps,the Ministry of Public Security, the Ministry of Defense procurement agencies and the Atomic Energy Institute. The event also welcomed representatives from the South Korean Military Academy and Ulsan National Institute of Science and Technology (UNIST), Republic of South Korea; the Victoria Police from Australia; the Royal Thai Airforce; the Cambodian Department of Immigration; and prominently, the delegation from the U.S.Department of Defense and Department of State supporting our keynote speaker Honorable Guy Roberts, Assistant Secretary of Defense for Nuclear, Chemical and Biological Defense Programs, U.S.Department of Defense and his colleague Dr. Christopher Ashley Ford, Assistant Secretary of Statefor International Security and Non-proliferation, U.S.Department of State. The duration of the NCT Asia 2018 conference was chaired by Col. (ret.) Henry Neumann, former Commander of the Bundeswehr CBRN Defense Command, Germany, who contributed his extensive expertise in raising interesting key points and inmediating the discussions during the conference.The opening plenary welcomed a keynote speech from Maj. Gen. Ha Van Cu, the Commander of the Vietnam People’s Army Chemical Corps outlining the organization’s role in CBRNe emergencies. The need for preparedness to radiological emergencies was introduced by Mr. JonBeville, from Heyl Germany, but echoed throughout the conference by Senior Colonel Le Van Dong, Director of the Centre for Toxicology, Radioactivity, Training & Research, Military Medical University. All noted that although Vietnam may not have any powerplants, this preparedness is key as neighboring countries could see radiological emergencies that know no borders. In this context, the role of domestic, international, cross-agency cooperation with relevant governmental and industry partners BRUKER is essential for progress and preparedness. The importance of cooperation can also be seen in the actions of the Philippines Coast Guard in mitigating CBRNe threats on the seas and within passenger transit areas, as presented by Lt.Vincent S.Laca, serving as the Chief of the Counter Intelligence Group, Coast Guards, Philippines. In order to understand and prepare for potential CBRNe threats,a key element is acknowledging their ever-evolving nature. This was emphasized by Mr. Tony Chow, Senior Bomb Disposal Officer, EOD Bureau, Hong Kong Police in his presentation on the strategies used in dealing with Unmanned Aerial Systems (UAS) and their nature as a threat when loaded with CBRN agents and/or explosives. On the other hand, Col. (ret.) Widders demonstrated how Kärcher Futuretech and Technisch-mathematische Studiengesellschaft (TMS) are using UAS to counter these threats, adapting their uses to decontamination. Innovation is key in keeping societies safe from newly emerging threats, preparing us for that which is difficult to prepare for. The NCT Asia platform aims at supporting innovation, facilitating knowledge-sharing and cooperation between relevant entities in this field to make this world a safer and more secure place. Additionally, during the scheduled program,conference delegates were introduced to ways in which NCT Asia 2018 sponsors are bridging capability gaps. Whether following a guided tour on (1)CBRNe Detection and Identification or on (2)CBRNe Post Event Response and Trainings, industry experts demonstrated how their products can present solutions to challenges faced by military and civil responders, and operators in responding to and preparing for CBRNe, C-IED and EOD emergencies. To end the day, on the evening of the 10th of October NCT Asia 2018 welcomed all its delegates to the second NCT Networking Reception where government, military and industry representatives had the opportunity to further continue discussions they had during the day over a refreshment and delicious canapés. Day two of the NCT Asia 2018 conference began with a session on medical countermeasures against CBRNe. Dr. Cuong Nguyen, representing the Ministry of Health of Vietnam outlined disaster risk management for the Health Sector in Vietnam and the ways forward including increasing the capabilities for early warning, increase in training and the importance of stockpiling amongst other things. Bioterrorism was also high on the agenda over the course of the two days as Dr. Kevin Yeoh, from Emergent BioSolutions and Dr. Nguyen Thai Son, Head of Microbiology Department, Military Medical University of Vietnam also outlined the specific threats as well as the available countermeasures and recommended procedures. The program also addressed the explosive ‘e’ in CBRNe with contributions from H.E. Kallyan Tep, the Deputy Secretary General of the Cambodian Mine Action and Victim Assistance Authority (CMAA) and representatives that have had first-hand experience of the use of C-IEDs on the battlefield such as Brig. Ponwar, Basant K. Ponwar, Inspector General of Chattisgarh Police, Director + Director Counter Terrorism & Jungle Warfare College, Kanker (C.G. ), Counter Terrorism & Jungle Warfare (CTJW) College, India. Finally, the afternoon session welcomed a representative from the collaborative entity VARANS as Dr. Nguyen Tuan Kai, its Director General, echoed once again the importance of radiological emergency preparedness.The event was closed by a ceremonial speech from Col. Xuan Kien Nguyen, Surgeon General, Military Medical Department, Vietnamas he handed over a shield from the Military Medical Department of the Vietnam People’s Army to Mr.IljaBonsen, Ms. Anna Paternnosto, from the CBRNe Society as well as the conference chairman Col. (ret.) Henry Neumann. Once again, the CBRNe Society was delighted to welcome high-level speakers, key experts and experienced operators in contributing not only to an interesting NCT Asia 2018 program, but also to a successful event.